This post is going to be short and sweet. “Short” because Fiddler makes working around this problem so simple. And “Sweet” because I think this is really powerful and will allow you to develop applications that show why cross domain access, in some situations, should be allowed. The code above will add this header to all HTTP responses. You can of course add an if statement so that the header is only added when a particular condition is matched, such as a responses from http://www.leggetter.co.uk. Once you have added your code to the OnBeforeResponse method you can save and close the CustomRules.js file. Fiddler will detect that this file has been modified and compile it in the background so that it can use the new code with each request and response that it processes. 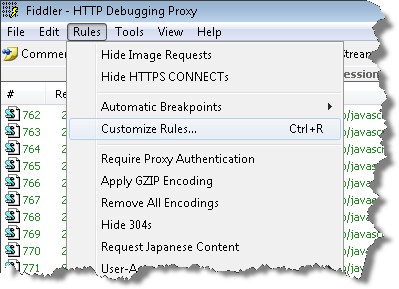 The next time that Fiddler is processing an HTTP response it will call this method, your code will run, and the Access-Control-Allow-Origin HTTP header added to the response. For more information on custom rules and generally developing using Fidder see their Developer Info section.